Bloomberg Businessweek contributing economics editor Farrell (The New Frugality: How to Consume Less, Save More and Live Better, 2009, etc.) debunks fear-ridden arguments about the graying of America leading to demographic catastrophes that will overwhelm Social Security. 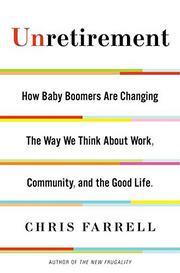 Retirement is a relatively new phenomenon, writes the author, and it is subject to rapid change. The elimination of a mandatory retirement age in 1986 and the accompanying redefinition of pension programs and reform of Social Security altered the rules in ways that are now feeding through on a larger scale, as “ten thousand boomers are turning sixty-five every day, a pace that will continue until 2030.” Farrell contends that longer working lives, increasing productivity and the transformation of employment—from more physical to more educationally qualified—will demolish the cases of those who want to gut the safety-net programs on which more than 60 percent of Americans depend. To support his argument, the author refers to studies from the Rand Corporation, the Urban Institute and other organizations. “Fundamentally, Social Security is sound,” he writes, “although it needs some tweaks to shore up its finances for the long haul.” Farrell also shares the Urban Institute's view that longer working lives and higher participation rates for older workers will result in cumulative savings for Medicare over the next 30 years. An unabashed proponent of preserving Social Security without cuts, he discusses when benefits should be taken and how they should be used in seniors' financial planning. Farrell's discussions with experts from academia, finance and research foundations offer support for the view that there will be employment available to those who want it. The author showcases many progressive programs and introduces individuals from different walks of life who are contributing. A valuable contribution to an ongoing debate, with arguments and resources for specialists and general readers.